The Exeter Book, widely regarded as one of the foundation documents of English literature and cared for by Exeter Cathedral Library since the 11th century, goes on display to the public today as part of a new major exhibition at the British Library in London. “Anglo-Saxon Kingdoms: Art, Word, War” is the largest ever exhibition on the history, literature and culture of Anglo-Saxon England spanning all six centuries from the eclipse of Roman Britain in the 5th century to the Norman Conquest of 1066. The book has inspired writers from WH Auden to JRR Tolkien, and was inscribed onto the UNESCO Memory of the World Register in 2016 for its significance. 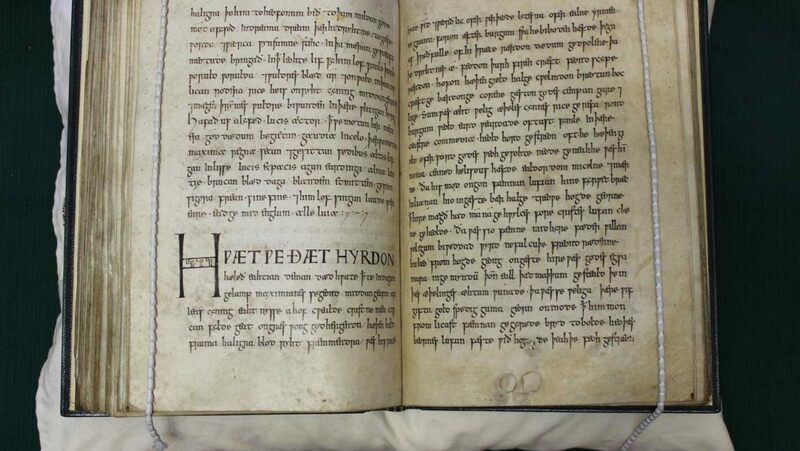 “Anglo-Saxon Kingdoms” brings together the four principal manuscripts of Old English poetry for the first time: the Exeter Book will be displayed together with the British Library’s unique manuscript of Beowulf, the Vercelli Book (returning to England for the first time from the Biblioteca Capitolare in Vercelli) and the Junius Manuscript (on loan from the Bodleian Library). “The Exeter Book has been in the care of the Cathedral’s Library since it was given to the Cathedral by Leofric (first Bishop of Exeter) in the 11th century, but it is only as recently as the 19th century that it started to receive the attention it derserved. “This exhibition has made it possible, for the first time, to unite these four pillars of English literature alongside other significant treasures. Exeter Cathedral’s Library and Archive was founded in the 11th century, and today cares for many thousands of documents from the 10th century to the present day. It was the first Cathedral to be awarded “Accredited Archive” status by the National Archives in 2014, with subsequent renewal in 2017. “Anglo-Saxon Kingdoms: Art, Word, War” runs until February 2019. Find out more and book now at the British Library website.